Yunnan tea is easily distinguished by the presence of golden tips (or buds), resulting in an attractive mix of tea leaves with dark and light colors. The leaves are larger than what is typical for Chinese teas. 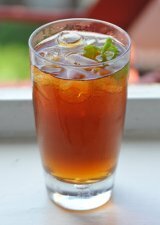 This type of tea is known as "Dian Hong" tea in China. Yunnan comes in different varieties that are differentiated by the proportion of golden tips to dark tea leaves. Generally speaking, more golden tips means a higher quality and more expensive Yunnan. 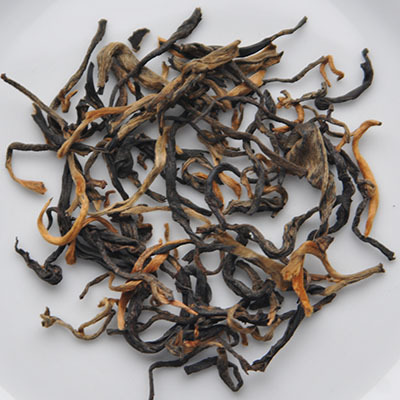 A top-quality Yunnan contains only golden tips. The flavor of Yunnan is often described as sweet, smooth, and sometimes earthy or with a hint of spice. Typically, the more golden tips, the lighter and more delicate the flavor. A large number of golden tips also results in a lighter brew. Many consider Yunnan a "forgiving" tea that does not become bitter when over-steeped. The proportion of golden tips also dictates the color of the tea. Yunnan comes from a mountainous region in Southern China, an area rich with tea history. Tea has been cultivated in the Yunnan Province for a very long time, by many accounts thousands of years! The production of Yunnan black tea (also called Dian Hong), however, is relatively new. Yunnan black tea has only been produced since the 1930s, when the Japanese invaded and gaiend control over the coastal regions of China. This forced the Chinese to cultivate tea in more inland regions so they could continue to export and trade tea, this time by land. Yunnan is made from the assamica variety of the camellia sinensis plant, which has larger leaves than the Chinese variety. Because of this, and because of the area's geographical proximity to Assam, India, it has been noted that Yunnan tea is similar in character to Assam Tea. The Yunnan Province also produces most of the world's pu-erh tea, a type of tea that undergoes post-fermentation.